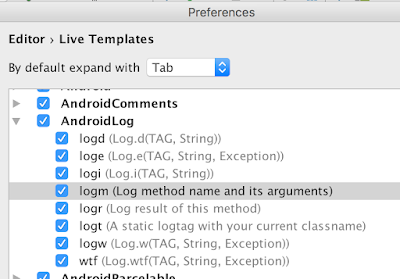 On Android, logging has always been an integral part of the development experience, first through the standalone LogCat utility and since through the Android Studio integration. The build-in LogCat now even offers advanced filtering capabilities based on logging level, regular expressions for package names, logging tag and the actual log messages. However, all this power is really only useful if you play along nicely at the source level as well, or you will drown in log messages without really knowing how to specify what you want to see. This is a common problem as the Android OS and any libraries you may use will spit out an obscene amount of logging, especially at the verbose level. ERROR – Don't use; if something this severe has happened, it is the result of an exceptional state rendering the application context invalid! The application should crash gracefully and collect relevant info for submission as a crash report to Google, CrashLytics, TPA etc. WARN – Something bad happened, but the application is still able to recover and continue executing albeit perhaps in a limited fashion. A developer can filter on the WARN level in order to learn about application states which are candidates for being handled better. INFO – Important business process that changes the state of the application significantly (database update, external system request, network connectivity change etc.) has completed. A developer can filter on the INFO level in order to get the big picture of what is going on at the task and flow level, which a non-developer should also be able to understand. DEBUG – Detailed developer insight into core decisions, states and events. VERBOSE – Don't use; very detailed trace information, intended only for temporary development insight (debugging and troubleshooting), should not risk being left in code and potentially be checked into Git (you are using Git right?). Instead you'll want to use a logging breakpoint as explained below. I think one of the problems with logging being used wrong it that it takes too much energy deciding on the appropriate level. By reducing the levels down to just 3, it becomes somewhat simpler to decide which one to use. Use only WARN, INFO and DEBUG and use them accordingly; WARN for things that should not happen but is recoverable, INFO for major changes and DEBUG for minor changes. I mentioned in the above section, that VERBOSE should not be used. This is because the stuff you'd put at the VERBOSE level is so detailed that it doesn't belong in source code (logging statements riddled everywhere makes code harder to read). 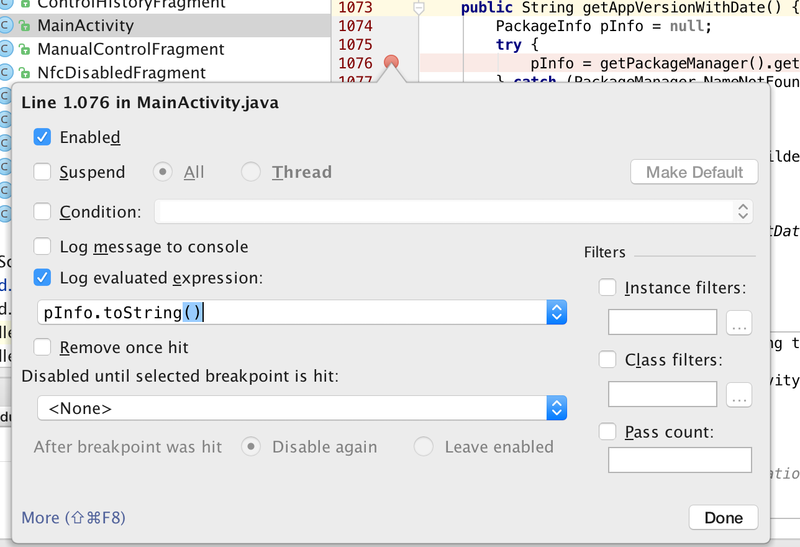 Instead, Android Studio offers a powerful hybrid mechanism between debugging and logging - basically it allows you to set breakpoints and rather than have these suspend program execution as usually happens, they merely log an expression to LogCat. This makes so-called logging breakpoints a perfect fit what you would otherwise have put in verbose logging statements at the source level. You can see this feature demoed here. This way it becomes a joy to see what's going on and simply jump up or down in the severity filter depending on how fine grained you want to follow along. To the left of the LogCat window is a vertical toolbar which you may also want to utilize a bit more - it took me a while before I started taking full advantage. Press the cog wheel to go to Settings to configure the LogCat headers and remove the checkbox in "Show date and time" as well as "Show process and thread IDs". This will give you 30 characters more on each line for actual valuable info. 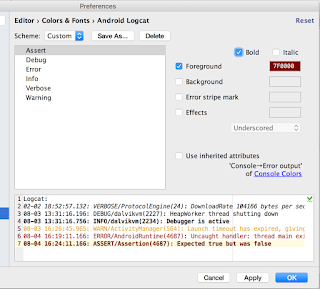 If you need to time something, there are better ways to do so using profiling tools like i.e. systrace. Sometimes I also remove the package name since the truly interesting part remains the TAG and associated message. While you are in the LogCat toolbar, familiarize yourself with the other options. Soft wraps can be very handy when you'd rather not miss something in a large message - typically serialized data. The restart button is also going to be needed from time to time, as adb or its integration with the device, is notoriously unstable and can play tricks on you. Even with filtering in place, sometimes you just have groups of related log info you'd rather be collapsed somehow. This is easy to do by right-clicking on the line in question (typically first line of what you want hidden in the fold) and writing an expression to match what will get folded. It's also here you can shorten excessive stack-traces and hide irrelevant internal calls. The above screenshot shows 3 similar lines for each Firebase remote config property loaded. The screenshot below shows how the 3 related yet different lines are now folded up under the parent "Successfully obtained Firebase remote config" log line. Last but not least, the color scheme used by Android Studio for LogCat can be improved upon a bit by making level-indication a bit more obvious (this becomes even more important when you are running a dark theme). I like to make all levels different in color and style so its easy to identify. 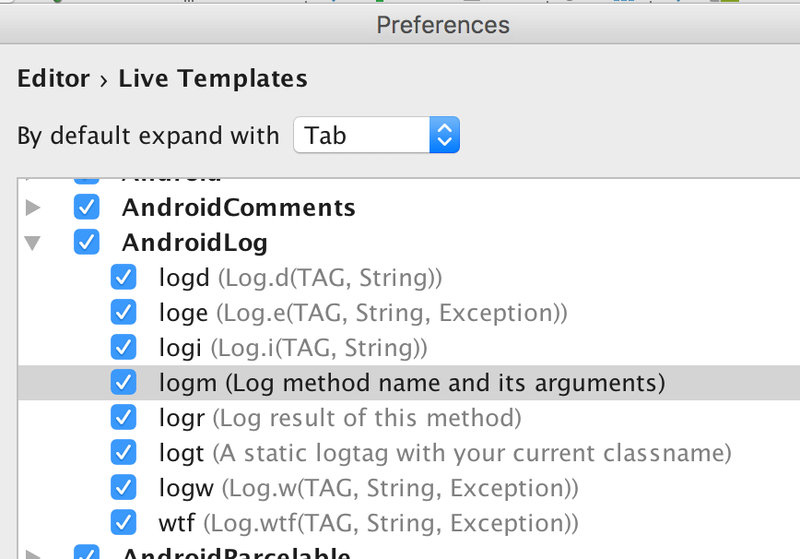 While the vanilla approach to writing logging statements on Android is to define a TAG constant with the same name as the class, this is a stupid practice in my opinion. Sure it is easy to adhere to (no thinking required) and can work well for small projects with only a few activities or views. This however, does not scale to projects with 50+ views and/or apps with complex life-cycles - it is simply too difficult to troubleshoot a problem and sooner rather than later you'd have to resort to a slow and tedious debugging session. So what to do instead then? Apps are, by definition, highly interactive and UI heavy. It thus makes a whole lot of sense, to trace UI aspects accordingly. The nice thing about UI events, is that it's surprisingly simple to get some broad standardized logging up and running which you won't have to worry about again when adding more views in the future. Oh and while you are in there, do yourself the favor and enable StrictMode for your debugging builds so that you bad dynamic behaviors of your app are logged. 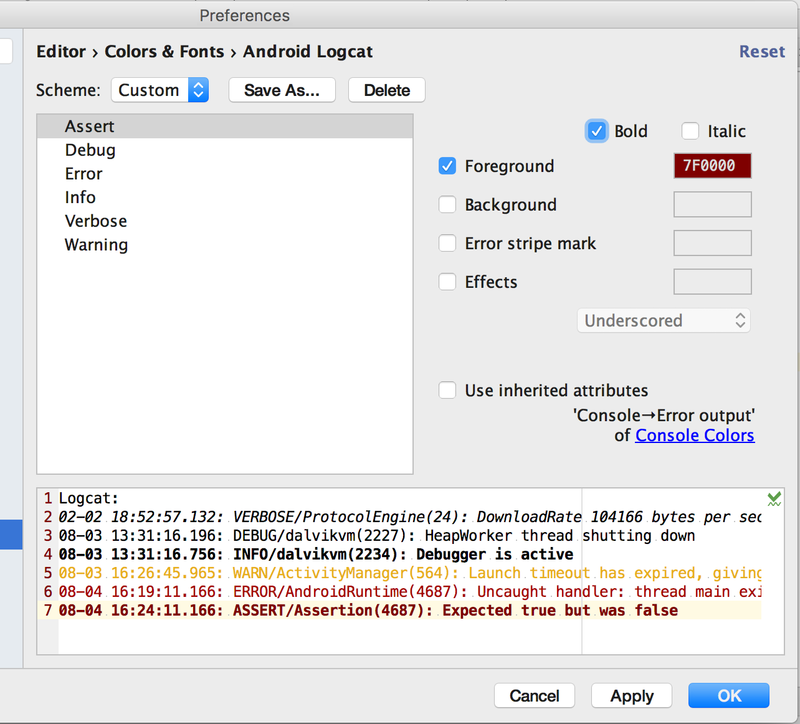 Android Studio is based on one of the most powerful IDE's available in modern programming so it also comes with handy templates. 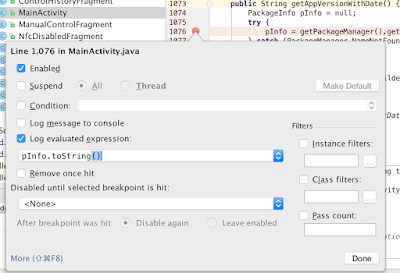 The logging templates available out of the box are context aware and will save you much time once you get used to them. Simply enter the template characters and expand with the tab key. The templates "logm", "logr" and "logi" remains my favorites. Note that if you are using other logging frameworks or custom wrappers, you may also want to target these explicitly to remove the bad weed "at the root" so to speak. The IDE and associated toolbox is our friend, and we do best to get to know it well since much time and frustration can be saved on that account. Hopefully there's a trick or two in the above you take away from this blog post, but let me just end with showing a matrix I use conceptually when narrowing down a problem in an app based on the proposed logging levels and application aspects above. The first matrix demonstrates filter settings when just wanting to following along and learn how the UI is put together when i.e. getting to know a new application. The second matrix is how you would think (and thus configure the logging) when wanting to screen an app quickly after a test suite has run, whether something exceptional happened anywhere. The last example shows how one would configure the filter when looking for issues in some app logic doing network communication.